I loved The Fault In Our Stars. It's definitely one of the best YA novels I've read for the past couple of years. It made me laugh, it made me cry and it made me appreciate my life more. The book gets really a lot of mixed reviews but I decided to give it a try and I really liked it. Most of you may know the movie but I didn't enjoy it that much. Still it's worth watching once you read the book. For those of you who didn't read it, it's a story about the 16 year old girl Hazel with stage 4 cancer who has been living with this diagnose since she was 12. She knows she's going to die and the only thing that keeps the tumor from killing her is the drug. At a support groups she meets Augustus, a cute boy in remission, that will change her life forever. 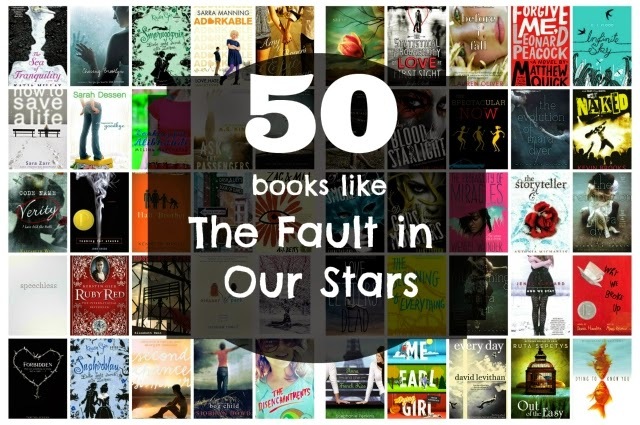 For those of you who already read it, I have a list of books that you may like if you liked The Fault in Our Stars. The Sea of Tranquility by Katja Millay is a beautiful novel about two teens trying to deal with life-changing tragedies. I loved this books even more than I loved The Fault in Our Stars. It gets better and better with every page. Both of the main characters are amazing. The story is told in a two person POV. It's not some silly cliche romantic book. What an absolute emotional rollercoaster. How to Save a Life by Sara Zarr is a story about Jill MacSweeney, a girl who just lost her dad and has been isolating herself from everything around her. Her boyfriend, her best friends and basically from every person who wants to help her. The story follow and the life of a second girl - Mandy Kalinowski. Mandy is raised by a mother who never wanted to have a child in first place. She knows the feeling and when she gets pregnant Mandy knows that she will never treat her child like her mother did. She's hoping she will find someone to care for her too. Reading about pregnant teens isn't the thing I like in books but this one really surprised me. A beautiful and well written novel. Okay, this trilogy's plot isn't similar to The Fault in Our Stars but I found it in every article about books you gonna like if you liked TFIOS so I decided to give it a try. I loved it. The Ruby Red Trilogy follow the story of Gwendolyn Shepherd, a time-traveling girl living in contemporary London. An amazing read for every YA novels fan. Looking for Alibrandi by Melinda Marchetta is another one of the books like The Fault in Our Stars. It's the debut novel by Marchetta. Most of you probably know her because of her Printz-winning Jellicoe Road. It's a story about Josephine Alibrandi and her final year at high school. A year that she will discover love, a year that she will find about all of her family's secrets and the year that she will sets herself free. A must read if you are a fan of young adult novels. Half Brother by Kenneth Oppel is a story about the thirteen years old Ben Tomlin who's the only child in the family until his mom brings home Zan - an eight day old chimpanzee. Ben's dad is a scientist trying to determine whether the chimpanzees can learn basic language skills. Ben's parent tell him he should treat Zan like a little brother. A very well written books with an unique story. Amy and Roger's Epic Detour is another one of the books like The Fault in Our Stars. I just finished reading it two weeks ago. I was absolutely in love with the plot. It follows the story of Amy Curry. Amy's dad died in a car accident and now her mom decided to move to another state. It's Amy's responsibility to get their car from California to Connecticut. After the horrible accident with her dad Amy isn't ready to get behind the wheel. Roger, an old family friend is ready to help her as he also has to make the trip. It's a beginning of an adventure and together they will rediscover themselves. An amazing and beautiful story. A must read. I love history books and I love strong female characters. That's why I loved Code Name Verity that much. It's a story about "Verity", a spy who's plane crashes in France at the time when it's occupied by Nazi Germany. She's captured by Gestapo and they give her two options: to tell them everything about her mission or to be executed in a horrible way. Can you keep a secret? I was very bad with it and during the years I learned to keep a secret the hard way. Speechless is a beautiful book by Hannah Harrington. It follows the story of Chelsea Knot, a girl that can't keep secrets. That's until the moment she shared one secret that destroyed her social life and almost got someone killed. Now Chelsea decides to be silent. She decides to keep her mouth shut so no one else is hurt. She stays quiet when people ignore her, make fun of her and even attack her. It's an awesome journey about self-discovery and if you liked The Fault in Our Stars I highly recommend Speechless. Second Chance Summer is a story about the young girl Taylor Edwards. Her family is ordinary. Everyone is busy but they get along pretty well. One day her dad gets horrible news, and her parents decide that the family will spend one last summer together at their old lake house in the mountains. A summer that will allow them to get to know each other again. It's a beautiful book about all the things that really matter and how easily we can forget about them once we are blinded by the ordinary daily life. Okay, a lot of people suggested this one as one of the books like The Fault in Our Stars so I had to put it on here even if I haven't read it yet. I find the plot kinda shocking but I will let you decide. It's about the pretty sixteen year old Maya that was never been kissed before and the seventeen year old Lochan. Maya and Lochan fell in love with each other but the thing is they are brother and sister. I know this book is kinda relevant because for sure there are people like this in the world but I couldn't get to read it because I know I couldn't sympathize with the characters. Adorkable by Sarra Manning is another book that you my like if you liked The Fault in Our Stars. It was suggested to me by one of my readers. It's about the very successful blogger Jeane Smith who also has half a million Twitter followers and her weird relationship with the star at the school Michael Lee. They have nothing in common but they just can't get enough of each other. I haven't read the book yet but I read couple of reviews about it and I am planning to buy it next week. My friends recommended me Ask the Passengers by A.S. King. I read it in 4 days and I loved it. It's about Astrid Jones who desperately needs support but she won't get it from her parents. She's falling in love with a girl, she's confused and she feels completely alone. She can't share her secret with anyone. It's a simple and beautiful story about a girl that tries to break free in the society. I am sure a lot of girls out there have the same struggles as Astrid and they can identify with her. If you are into this kind of books I strongly recommend it. Dash & Lily's Book of Dares by Rachel Cohn and David Levithan is probably one of my favorite books in this list. I have to warn you that this book receives mixed reviews so a lot of you may not find it as good as I did. I read it just before Christmas when I felt a little bit down and it really improved my mood. It's an unique story about Lily who has left her red notebook full of all kind of challenges on a shelf in her favorite bookstore. She's waiting for the right guy to come and accept her challenges. Chasing Brooklyn by Lisa Schroeder is a story the young woman Brooklyn who's boyfriend died a year ago and who's friend died of an overdose. Every time she closes her eyes her friend visits her dreams. She's trying to figure out what he's trying to tell her and why the ghost of her boyfriend doesn't visit her. I never liked the ghosts stories much but this one was really good. This is another one of the books like The Fault in Our Stars that I recommend. I haven't read What Happened to Goodbye by Sarah Dessen yet but if you search for books like The Fault in Our Stars on Google this is one of the most recommended books out there. It's a story about the life of McLean and her dad who just had a divorce. They are trying to leave their unhappy past behind by traveling. Each new place is an opportunity for McLean to try a new personality: from cheerleader to drama diva. Now, for first time, she wants to stay in one place and just be herself. Lovely, Dark and Deep by Amy McNamara is amazing. One of the best books on the list in my opinion. It's not very well known as it's the debut novel of Amy but you won't regret reading it. It's a lovely story about Wren Wells who was in a car accident with her boyfriend. She survived but he didn't. After the accident Wren isn't the same. Instead of going to a college she retreats to her dad's studio in the far-north wild woods of Maine where she can be alone. An amazing story about rediscovering love and hope. Eleanor & Park by Rainbow Rowell is everything I've been searching for since I finished The Fault in Our Stars. Such a great, inspirational book about the love between two misfits. It gave me so many awesome feelings. At the beginning I didn't want to read it at all since it was one of these books everyone couldn't stop talking about. Also it was set in the 80s which I thought it's annoying. BUT I was so wrong. I fell in love with the characters and the amazing story. This one is one of the best on the list. If you don't believe me go and check the reviews on the other sites. A lovely book. Okay, most of you probably watched the movie already and were disappointed. At least I was since I've read the book first. The book is better. Much better! I read Bog Child by Siobhan Dowd last summer. I was kind of depressed at the time and this books really made me feel better. It's one of the best books on my list and my favorite one by Dowd. It's so sad the author lost a battle with cancer before this book was published. The Disenchantments by Nina LaCour is another book like The Fault in Our Stars. It's a story about Colby and Bev. They have a plan to graduate and spend the next year on the road with Bev's band traveling in Europe. After the tour finally kicks off everything changes. Bev is changing her plans by announcing she's starting college in fall. But the tour must go on while their relationship changes. I often recommend John Green's books but this one is definitely on of his best ones even if it's not one of the most popular. It tells the story of Miles, a smart teenager who decides to go to the same boarding school his dad attended. It's an amazing book about life, death, love and understanding what pain and suffering are. Zac and Mia by A.J. Betts is another amazing book in my list. It's really a heartbreaking story of the seventeen-year-old Zac who's battling leukemia. During his treatment he meets Mia, a cancer patient in the room next to his. An incredible story about their strong, strange connection. This is one of the best books on the list. Highly recommended! Shine by Lauren Myrcale is a really amazing story about the sixteen-year old girl Cat. Her friend is a victim of a horrible crime and Cat is trying to find who did it. In this book you can see the best and the worst in people. A story about love, bigotry and friendship. If you are a fan of mystery and crime books this one is for you. Do you believe in love of first sight? The Statistical Probability of Love at First Sight by Jennifer E. Smith is an example how four minutes can change everything. It's a fabulous story Hadley Sullivan who misses her flight and meets the perfect boy. The long time on the plane passes fast and she falls in love. The two lose track in the arrivals chaos. Will they see each other ever again? Thirteen Reasons Why by Jay Asher is another one of the books like The Fault in Our Stars and another one of the great young adult mysteries. Everything starts when Clay Jensen returns back home and finds his name on a mystery box left on his porch. The box contains thirteen cassettes recorded by Hannah Baker, one of his classmates and his crush who committed suicide two weeks earlier. Daughter of Smoke & Bone by Laini Taylor is an amazingly good fantasy young adult trilogy. I know a lot of you are fans of the genre so you should definitely check it. Love Letters to the Dead by Ava Dellaira is one of the most popular books on the list so a lot of you probably already know about it. The rest of you who don't should really try it. It's a heartbreaking yet beautiful and entertaining story. Anna and the French Kiss by Stephanie Perkins is one of the best books on the list. It's a books about Anna who meets the perfect, charming, handsome boy while she is off to a boarding school in Paris. She falls in love but the problem is that her perfect man has a serious girlfriend. It's one of the most realistic love stories out there. If you loved The Fault in Our Stars you gonna love The Beginning of Everything by Robyn Schneider also. Ezra is a young promising tennis star with what seems to be a perfect life until an accident changes it all. His knee is injured and he's no longer popular. A lot of people forget about him and his girlfriend leaves him for one of his friend. It's a fabulous story about a boy who discovers what a real friendship really means and how to deal with all the challenges in life. Me and Earl and the Dying Girl by Jesse Andrews is such an amazing book. A lot of you probably know about the movie too. It's a story about Greg and Earl who make a movie about Rachel, a girl diagnosed with leukemia. It's probably the best debut novel I've ever read. This book will make you laugh and cry. Read it! Before I Fall by Lauren Oliver is a debut romance fiction novel. It's a story about Samantha, a high school senior who dies on "Cupid Day" in a horrible accident. However she still wakes up the next day. In fact she lives her last days seven times and every time she makes even the slightest change she realizes hot big power she holds. One of the best young adult fictions books I've ever read. The Spectacular Now by Tim Tharp is another one of the books like The Fault in Our Stars. It's one of the most popular ones on the list. It's a thoughtful, realistic and heavy book. Don't expect to read it overnight. The plot follows the story of the popular boy Sutter Keely. His life is a big party and he has no plans for the future until someday he meets the weird and socially awkward Aimee. Now he has a power to change someone's life for good or destroy it forever. I haven't read Forgive Me, Leonard Peacock by Matthew Quick yet but I found it as a recommendation almost everywhere I searched for books like the Fault in Our Stars. It gets hundreds of positive reviews so you may want to check it. Every Day by David Levithan is an adult fiction novel you really gonna love. It's about the teenager A who wakes up every morning in a different body. Everything is okay until one morning when A wakes up in the body of Justin and meets Justin's girlfriend. He finally finds someone he wants to be with. Another one of the books like The Fault in our Stars is The probability of Miracles by Wendy Wunder. Cam is a teenager girl who's living with a cancer. Her last test shows she doesn't have much chance for surviving it and she loses all hope. But her mom still believes miracles can happen and convince her to spend the summer with her in Promise, Maine, a place famous of its miracles. Cam has one summer to believe in miracles. You gonna love the Mara Dyer Trilogy by Michelle Hodkin. It's an amazing mystery fantasy romance trilogy. One of the best YA out there. Mara Dyer wakes up in a hospital without any memory of how she ended up there, or about the accident that killed her friends. She's searching for answers. The Storyteller by Antonia Michaelis is another fabulous book on the list. It's a love story between Anna and Abel. They are both seventeen-year old and last year in school but they are very different from each other. Anna lives in a nice old town, Abel in an old prisonlike building taking care of his little sister. A beautiful heart-breaking love story. And We Stay by Jenny Hubbard is a young adult novel that follows the story of Emily Beam, a girl that was almost killed by her ex-boyfriend with a gun at school, before he took his own life. After this Emily moves to another school hoping she can heal her own damaged self. The people who love poetry will also like this book. It's full of nice beautiful poems. Such an inspirational and heart-wrenching book! Out of the Easy by Ruta Sepetys follows the story of the seventeen-year-old Josie Moraine, a daughter of a brothel prostitute in France in 1950. She has dreams and she wants more from life than what her mother got. She has a plan to leave but mysterious death leaves her tangled in an investigation. It's a story about a girl caught between the dream of an elite college and better life and the awful underworld. Here's another lovely novel: Infinite Sky by C.J. Flood. Life is tough for Iris after her mom leaves home and her brother goes off the rails while her dad tries to hold everything together. One day a family of travelers sets up a camp illegally in front of their farm. Iris seeks for a distractions and she sees this as an adventure. She secretly starts a friendship with the gypsy boy Trick who will change her life forever. The second book is coming out this year. Okay, Why We Broke Up by Daniel Handler is one of the most unique books on the list with absolutely amazing plot. Min and Ed are breaking up, so Min is writing a letter to Ed and giving him a box full of all kinds of stuff... the reason they broke up. I won't spoil anything for you but I promise you this is one of the best books on the list. Naked by Kevin Brooks is a story about 1976, punk, rock and the sixteen-year old Lili that gets caught in the London's underground punk scene. A story about violence, love, hate, heaven and hell. This is one of these books from well-known authors that you just know it's gonna be huge. People that are much more into music will enjoy it more than me. Dying to Know You by Aidan Chambers is the last one of the books like The Fault in Our Stars. It's one of the lesser known books on the list but a lot of you is gonna love it. It's an amazing and unique story about Karl, a seventeen-year old boy who's madly in love with Firella. The thing is that Firella demands proof and asks him series of questions about his attitude and all the aspects of love. Karl is is dyslexic and he's so worried Firella will find out and will think he's unworthy that he asks a writer to help him construct his replies. One of the books with most unique plot here. That was my list of books like The Fault in our Stars. I hope you liked it! If you have more suggestions post them in the comments!